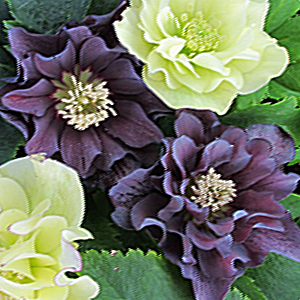 (Lenten Rose) Winter Jewels™ Series Helleborus ‘Onyx Odyssey‘ is a dramatic and elegant beauty. Her flowers are slate purple to near black in color with 15-20 petals per each large 3″ bloom. The foliage of Winter Jewels™ Series ‘Onyx Odyssey‘ emerges purple in early spring and matures to a lovely shade of green. A unique addition to any garden! On a recent walk through the greenhouses I was hoping that I would find some signs that Spring is near. I actually was suprized by several varieties that had some blooms. 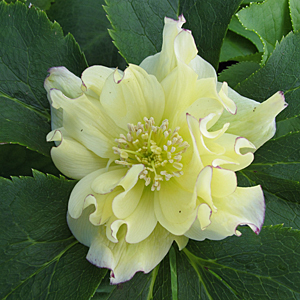 Today I will feature Royal Heritage™ Strain Helleborus. Royal Heritage™ Strain Helleborus orientalis will have you pleasantly surprised with the wide array of colors included with this interesting hybrid strain of Helleborus. Purple, near-black, white, pale green, yellow, pink, rose, and red flower colors are possible, some are spotted or brushed with a contrasting color on the 2 inch wide blooms. Royal Heritage™ Strain was the 2005 Perennial Plant of the year award winner. (Lenton Rose) Berries and cream! Helleborus ‘Berry Swirl’ comes from Marietta O`Byrne and her Winter Jewels™ Series. Each petal of ‘Berry Swirl’ displays soft brushstrokes of orchid shades, some with creamy-white centers, and are finely lined with an orchid edging. 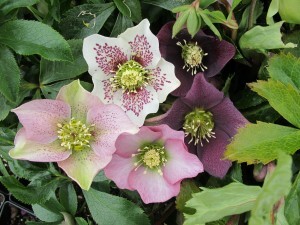 Hellebores are called the Lenton Rose because they flower in early spring during the Lenton season.